Andrew Sullivan wrote another column about the Richard Grenell resignation today in which he revealed specifics about the way Grenell was muzzled by Mitt Romney’s campaign. Essentially, they were so scared of the Bryan Fischer-led anti-gay backlash that they told Grenell to shut up — even on a conference call that Grenell himself organized. He’d been part of organizing a conference call to respond to Vice President Biden’s foreign policy speech, now known best for the “big stick” remark. So some reporters were puzzled as to why Grenell, a week into his job as Romney’s national security spokesman, was not introduced by name as part of the Romney team at the beginning of the call, and his voice completely absent from the conversation. Some even called and questioned him afterwards as to why he was absent. He wasn’t absent. He was simply muzzled. For a job where you are supposed to maintain good relations with reporters, being silenced on a key conference call on your area of expertise is pretty damaging. Especially when you helped set it up. Sources close to Grenell say that he was specifically told by those high up in the Romney campaign to stay silent on the call, even while he was on it. And this was not the only time he had been instructed to shut up. Their response to the far right fooferaw was simply to go silent, to keep Grenell off-stage and mute, and to wait till the storm passed. This should put to rest any attempt to give Romney or his staff the benefit of the doubt in this situation. Their actions — at least their public ones — were cowardly. I might add that the private conversation among many Republicans in this town is that this was unjust and unfair. The Romneyites are correct when they say they tried to talk him out of it. But they kept and keep their views quiet. The gay-inclusive elements in the elites simply do not have the balls to tackle the religious right. And this is particularly true of Romney, as this case now proves. The Christianists gave Bush a pass on social issues because of his born-again Christianity. 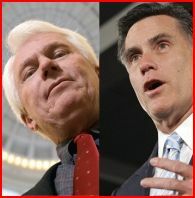 They trust Mormon Romney not an inch. And this week demonstrates without any doubt that Romney will therefore not be able to deviate from their wishes an iota. He has no room to maneuver. The notion that he could be a moderate on social issues in office is, alas, a pipe dream. Whatever any of us thinks of Sullivan, Grenell, or Romney personally or politically, the specter of a president beholden to the pathologically anti-gay religious right should send chills up the spine.